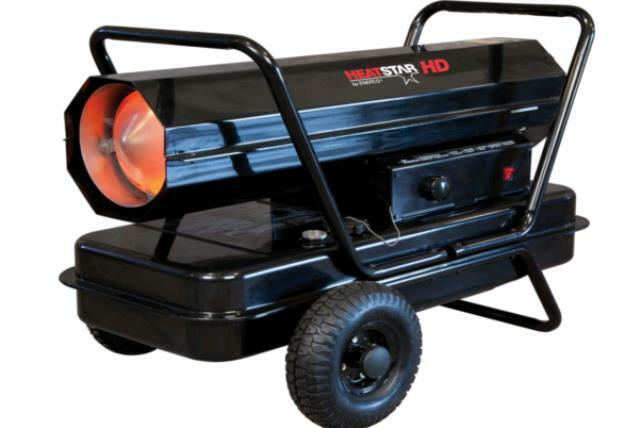 These heaters burn kerosene to produce hot air. The heat if forced out by a high power fan in the unit. They need to have a constant source of electricity (50' cord max) to run, both to ignite the fuel and to force the air. These heaters do create CO and need to be used with care. Using these in an enclosed area can easily result in death. Do not leave unattended. 9 gallons of kerosene to fill unit. Transport in pick up truck. Will leak kerosene if not upright. AKA: Torpedo heater, Salamander heater, Construction heater. * Please call us for any questions on our heater 125mbtu kerosene forced air in Concord, serving all of New Hampshire, including Manchester, Canterbury, Loudon, Hillsboro, and Northwood.